Many detail design changes were made to the Kabinenroller to make it more cost efficient to produce. There were no more exterior two-tones, but a range of metallics was introduced. The interior trim was simplified, and the polished wood strips eliminated. The colour-matched interior paint was reduced to one scheme common to all exterior colours: grey primer with black paint in visible areas only. The radio hole was phased out. The dash layout was redesigned yet again, with an Isetta-style lighting switch and toggle blinker switch. The heater hose now ran forward along the floor under the trim panel. The rear swingarm/chaincase had been redesigned at chassis no.65,186. The change to Bosch Dynastart electrics at chassis no.68,494 with its corresponding bigger crankshaft was unavoidable, as they had bought out Siba. Other later changes involved suspension bushings, wheel stud diameters, cabin leather strap changed to fabric, and finally, the T-handle changed to an easier-to-use L shape. 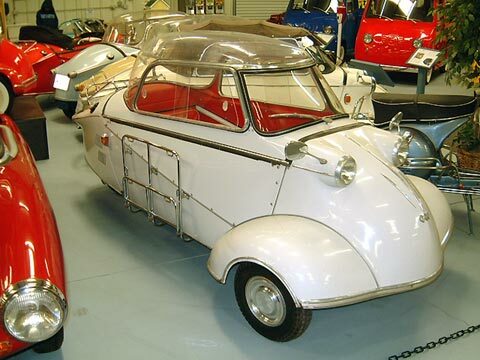 This car features a rarely seen factory accessory: the side mounted luggage rack, which was also convertible to hold two pairs of skis, and had been available since the earliest days of the KR-175. Weight: 230 kg Electrics: 12 v 3 Wheels: 4.00 x 8"